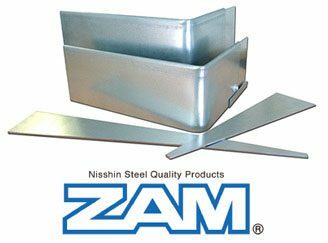 Australian Made Galvanised Steel Edging – An affordable and durable edge. Our Australian made BlueScope®, hot dipped Galvanised steel edging has a structural guarantee of 10 years, ensuring your confidence when purchasing and installing FormBoss™ in your garden. We supply edging for practically all garden applications, our retail gauges are perfect for your garden borders around your family home, however if you require something stronger for commercial pathways or concrete formwork, our industrial strength gauges will stand up to the most severe conditions and will last up to 40 years in the ground. Gauges Available: 1.2mm, 1.6mm, 2.0mm. Heights Available: 75mm, 100mm, 150mm, 185mm, 230mm, 290mm, 390mm, 580mm & custom.